This is not a simple drive to Kranji. You need to turn right and turn right – you know what I mean. Lim Chu Kang is the most rural area of Singapore, and you will be amazed and how “ulu” this place is. Bring your GPS, google the place in your iPhone, get ready for the joy-ride. 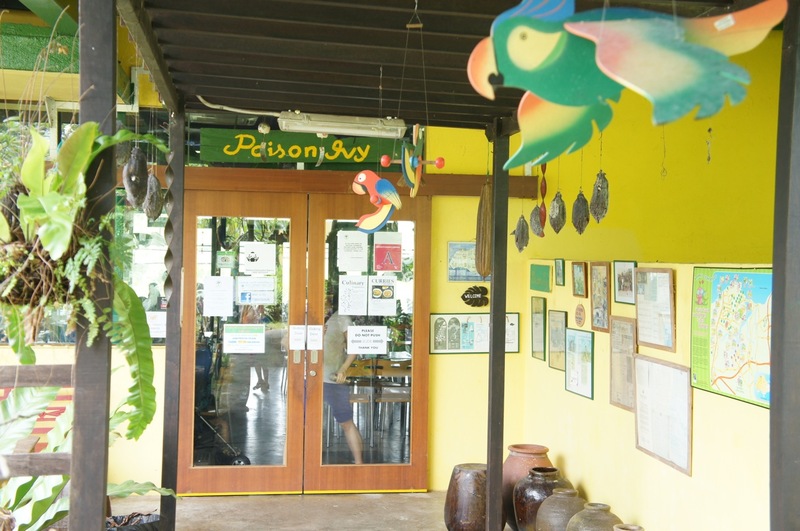 The Bistro is called “Poison Ivy” – no, nothing served is poisonous, no cobras, scorpions and such. Painted in earth tones of green and yellow, this place was overran by greenery of all kinds. Pandan leaves on the way in to the bistro greeted us with a gentle whiff of its aroma. Dill growing abundantly in the farm behind the Bistro assured us that the food was going to be organic and rustic. The menu was restrictive to what was growing in the gardens. For today, we had a choice of Sweet Potato Leaves, Kangkong (a rarity) and Spinach for greens, and a selection of spicy and savoury choices from the Warriors. So we ordered a Warrior Set ($10 per head) that came with 6 mains and 1 side. 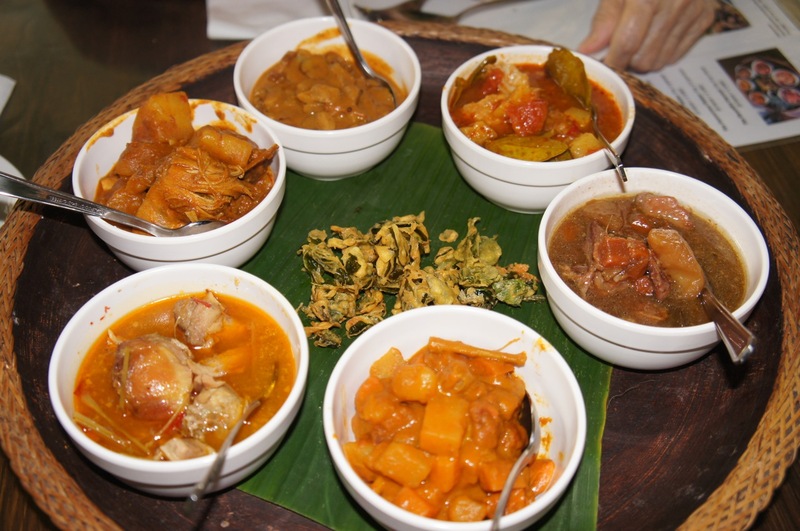 The portions were not as big as we hoped, but we had a taste of everything – Chicken Curry, Jackfruit Lemak, Pineapple Fish, Potato and Carrot Masala, Stew Chicken, Bolly Banana Curry, and a side of Morning Glory tempura. It came with a choice of brown and steamed rice. Greens are not part of the set, so we ordered kangkong and sweet potato leaves. As well as Grilled Chicken (all spicy so must add something for the princess) and Otah Omelete. The kangkong were chopped to pieces so small you could not believe it was kangkong. 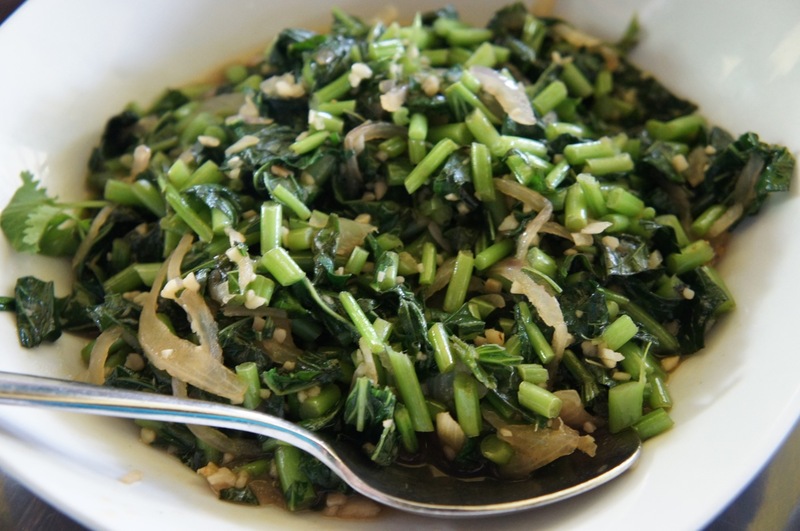 Different from the commercially available variety, these kangkong were slimmer and crispier. 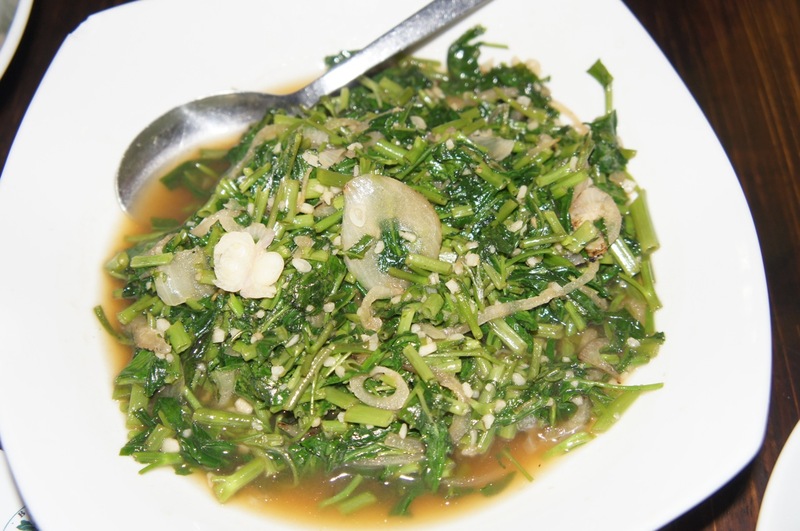 Liked the kangkong, the sweet potato leaves were mutilated beyond recognition. I prefer to leave them in the original state of leafiness would be better. 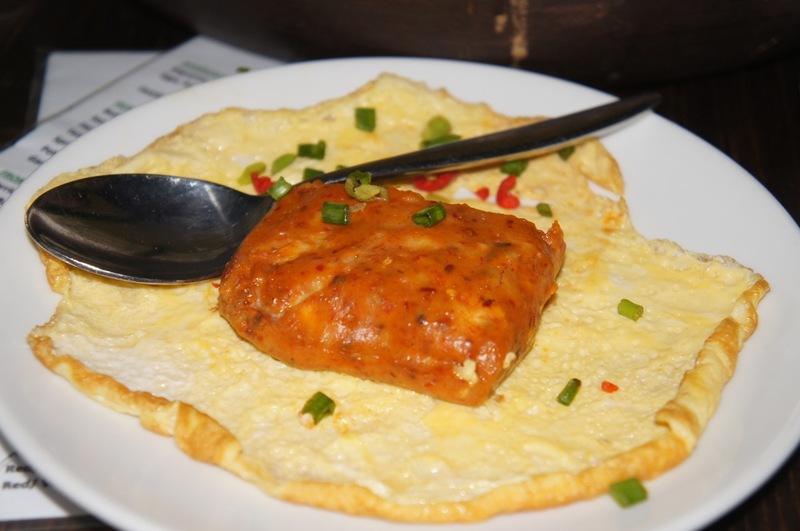 The Otah and the Omelete were two separate entities. So princess could still have her omlete while we ate the otah. It was like an omelete with a big piece of otah put on top. 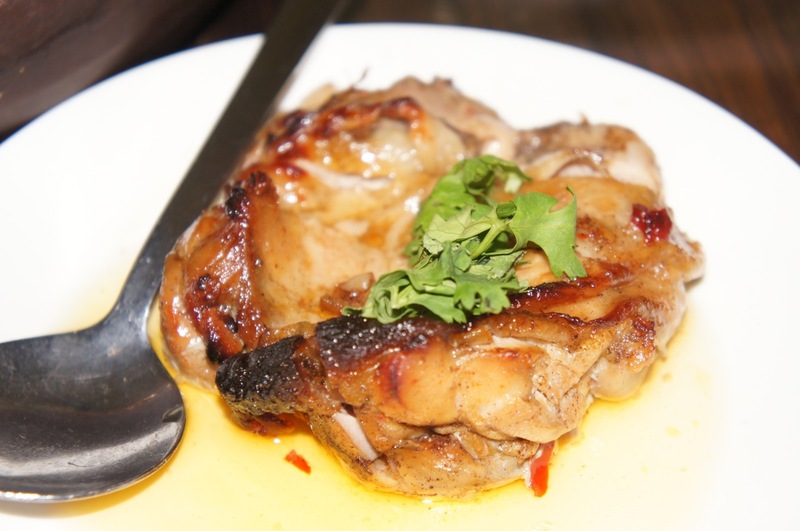 This was the most disappoint dish today – a piece of chicken grilled with a honey coating. The banana cakes (original and chocolate) were brilliant. 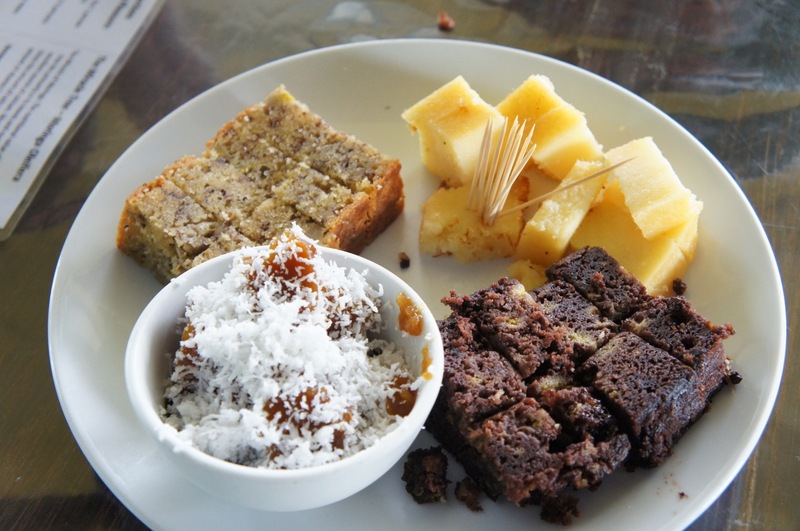 Nutty and strong banana taste, it was a perfect compliment to the lunch. The tapioca cake was also good. But the kueh don’t know what was a failure because the coconut shaving had turned bad. 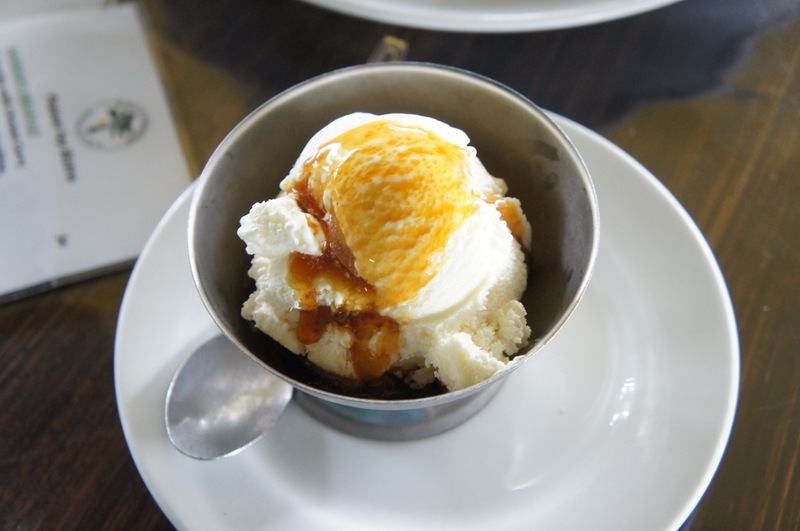 Normal vanilla ice cream was elevated to the next status with the drizzling of gula melaka. All in all, the lunch was a good affair, the rustic charm of the surrounding, a not-too-warm afternoon that was helped by the cloudy sky, and plenty of fresh air. Would not go very often but where else can you find these combinations in plenty in our tiny red dot? Food: 2/5, nothing to shout for, but 5/5 for the concept. Ambiance: 5/5, Rustic charm, farm feel. Service: 3/5, Homely but too busy. Price: At $20 pax, not expensive.